Underneath every Google search result are snippets, i.e. extracts of information that describe what is on a webpage – in most cases this would the page meta description. 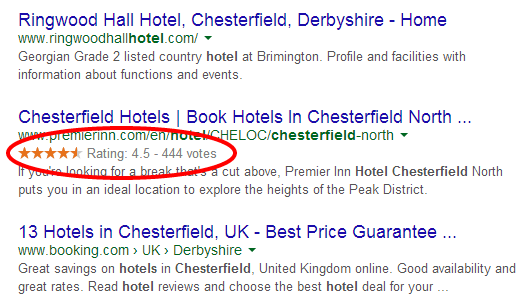 People carrying out searches use these snippets to decide which link in the results to click. Rich snippets are designed to enhance the information that Google gleans from a site by providing additional data, offering users more of the details they need to make a more considered decision. Looking for a recipe? It’s likely that the one with golden stars, a calorie count and an image will catch your eye. Looking to make a purchase? Search listings with prices, reviews and product images attract more clicks than text-only listings, and those clicks lead to more purchases because the buyer arrives at the target site already well informed about the product and pricing. These additional details are rich snippets. Any website owner can insert code into their website’s HTML that helps Google to understand what they have to offer and, although this does not guarantee that rich snippets will appear in search listings, if they are inputted correctly and the site is good quality, they are far more likely to be implemented. In 2011, Google surprised many by working with Yahoo! and Bing to create schemas that could be included by website owners and understood by all of the major search engines. By using some uniform, recommended code, webmasters could make their businesses and websites stand out against the competition with added information in their search engine listing. The explanatory website says that “Schema.org provides a collection of shared vocabularies webmasters can use to mark up their pages in ways that can be understood by the major search engines”. These ‘shared vocabularies’ are paired with microdata, which is a way to include metadata within the HTML of a webpage in a way that is understood by search engines but not visible to browsers. These days, there are many, many topics that can be catered for with schema.org, from airlines to warranty promises, so how do you set up the microdata on your website? 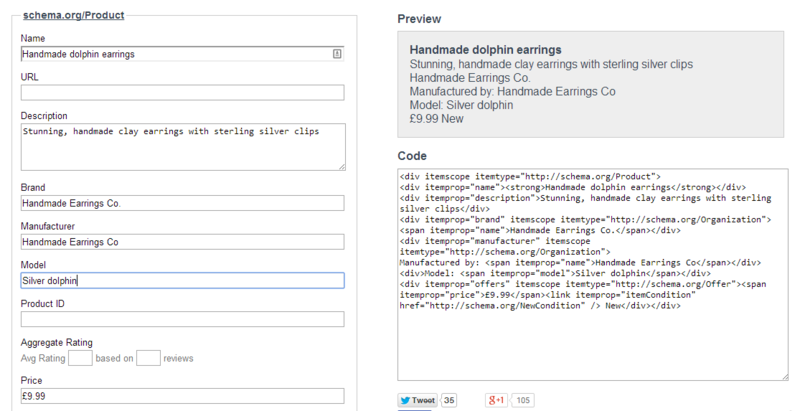 In this example, I use Schema Creator to build the code necessary to list some (fictional) earrings. I inputted information about the product, its manufacturer, its price and so on into the boxes on the left-hand side of the screen. This data was then translated into code, on the right, and I could see how the rich snippet would appear to a search engine. The code can be copied and pasted, and the next step is to test it with Google’s Structured Data Testing Tool. This tool should be used to test any new rich snippets or schema microdata before it is added to a website’s code. The Structured Data Testing Tool is easy to use and results are instantaneous. We can see that, in this case, the code is correct and the data is correctly displayed. 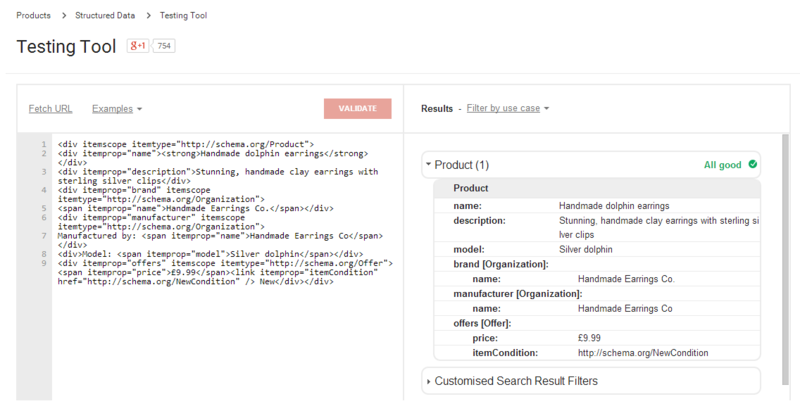 Google’s Structured Data Markup Helper is another tool that helps websites and businesses to create the schema.org markup code required for their websites. Google Authorship was a much-vaunted form of markup that became very popular with bloggers and webmasters. It enabled users to connect the content they created to their Google+ profile and resulted in their names and photographs showing up within Google search results. Google Authorship was relatively easy to set up and many people embraced it. Users reported higher click-through rates when the Authorship markup was active in the search results and it was thought that Authorship also helped to identify individuals as experts and authorities in their fields. Then, just as people were getting used to it, Google withdrew Authorship from use. Google’s John Mueller announced that “Unfortunately, we’ve […] observed that [Google Authorship] information isn’t as useful to our users as we’d hoped, and can even distract from those results. With this in mind, we’ve made the difficult decision to stop showing authorship in search results”. And, just like that, it was gone. Mueller went on to recommend using schema.org, as described above. He confirmed that schema.org “helps all search engines better understand the content and context of pages on the web, and we’ll continue to use it to show rich snippets in search results”. Have you set up rich snippets and nothing has happened? Don’t panic. Changes to website code can take hours, days or even weeks to register with the search engines, depending on how frequently they crawl a website and update their index of the web. 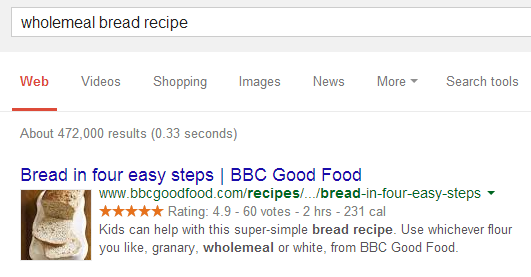 It can take a while for rich snippets to show up in search results, so set them up and be patient. If, after several weeks, you still don’t see the markup you added being displayed, it could be that Google has detected technical or quality issues, which are explained here. Although the process of creating the code for schema.org markup may be a little tricky, the value you can receive from the higher click-through rates and increased visibility in the search results will be your reward. The vast majority of small- and medium-sized businesses will be able to find a schema.org markup that suits their company and, once it is implemented, it does not need to be maintained or updated. Even though adding markup data does not, in itself, result in higher search engine rankings, it does tend to result in higher click-through rates. And higher click-through rates, arguably, do result in higher search engine positioning in the future. If you have any questions about rich snippets, or want to share your experience using them, please leave a comment below.